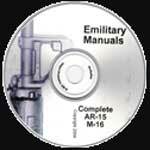 On this download you will have 17 different maintenance and repair manuals giving you every detail you will ever need to take care and repair this weapon. Plus the History and Evolution of the Ar-15 Rifle, Cleaning and Lubricating the AR-15 & M16 and details on all Colt, Armalite, Bushmaster, Hesse Arms & Pre and Post Ban variants. The original AR-15, designed in 1959, became the M16 after Colt acquired the manufacturing rights in 1962 and it became the main weapon of our troops in the Vietnam conflict.